Registrations for our Executive Master are open for the 2018-2019 academic year! IEE-ULB organises an Executive Master’s degree, a customised training programme of 40 credits in English. Discover our Executive Master in European Union Studies. The Executive Master’s in European Union Studies is customised and certified training. Taught in English, the programme offers participants the advantage of its flexibility. They can follow the full programme or tailor it by taking specific modules or courses. Developed for practitioners who seek to sharpen knowledge and skills in EU governance, the programme offers insights about how the EU really functions and how its policy-making process works. The Executive Master in European Union Studies (MEUS) is a certificate with a staggered timetable during the evenings or on Saturdays. The programme includes a common set of core of courses that cover the fundamental aspects of the political, economic and legal integration, a “professionalization” module, a “final dissertation” module and specialized optional modules. Some courses are available online. Media, Information and Communication: journalism, facts and disinformation (“fake news”), communication in the EU, public diplomacy. The Area of Freedom, Security and Justice: challenges to the rule of law, asylum and migration, criminal justice in the EU. The EU in the World: The Union’s relations with its neighbourhood, and developing countries, enlargement policies, environmental law. A professionalization module: EU project management and career development. Finally, participants in the full programme follow a Seminar on methods and academic writing in order to complete a dissertation. The Executive Master in European Union Studies is a programme in English that can be followed à la carte. Discover our courses, professors and methodology. Download this Executive programme’s brochure and find out more about its courses, deadlines, fees and other practical information. The Executive Master in European Union Studies addresses the real issues faced by European institutions. To achieve a solid training that combines knowledge and savoir-faire, the programme brings together academics and professionals of European affairs. The goes is to offer a dynamic environment for acquiring new knowledge and competences while creating networking opportunities. Who is this executive programme for? 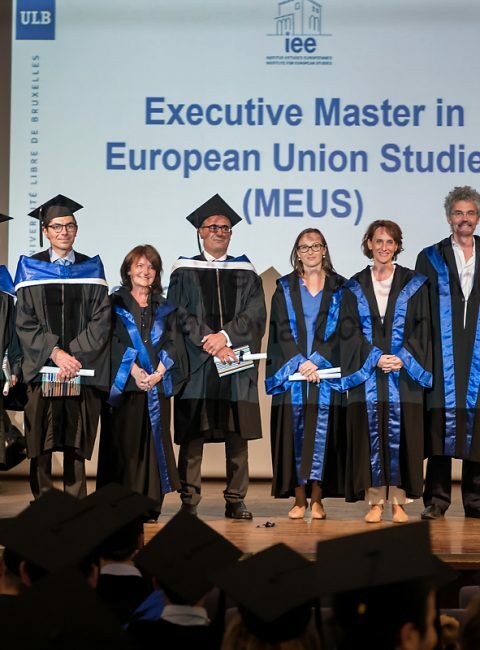 MEUS is organized under the provisions of the ULB’s regulation on Executive education and is subject to the Decree of 7thNovember 2013 on the landscape and organization of higher education in the “Communauté française de Belgique. As a result, the Executive Master in European Union Studies (MEUS) is issued by the Université libre de Bruxelles and the Institute for European Studies and is agreed by ARES (Académie de Recherche et d’Enseignement Supérieur) which is the federation of French-speaking higher education institutions in Belgium. The jury of the Executive Master program delivers a Level 7 “certificate in European Union Studies” issued by the ULB and the IEE and showing the credits achieved (certificate supplement). Participants should be aware that this certificate is not the equivalent of a regular master’s degree (120 credits) or a specialized master’s degree (min. 60 credits). MEUS is not funded by the “Communauté française de Belgique”. This Executive Master’s degree is reserved for professionals. To learn more about the admission procedures, take a look at the specific page. The Executive Master in European Union Studies is a programme in English that can be followed à la carte. Do you have any other questions? The Student Affairs Office can help. Please contact Olga Minampala at +32 02 650 40 52 or meus.iee@ulb.ac.be for information regarding our Executive programmes.